Herewith I thank you for the great deal you gave us at the PGA course last week. We had a wonderfull time there. We will certainly come back to you in the future. Many thanks yet again for all the arrangements for our trip which went off really smoothly. It’s probably the best trip we have done. Thank you once more for your hospitality, the courses were magnificent and we were happy with the equipment as well. Hope to see you another time! 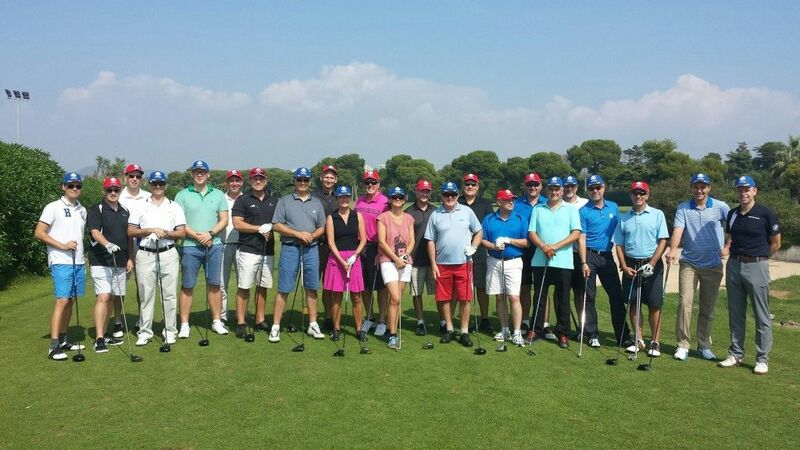 I would like to sincerely thank you for making our Barcelona golf trip an amazing experience!!! The courses were spectacular, each course provided a different challenge, and the views of Catalonia were breathtaking! Perfectly arranged events. You showed a great helpfulness with bookings of hotels, golf courses and transport. The hotel, golf courses and transport was of the highest quality. Just wanted to drop a few lines to thank you for a very nice golfing trip. Everything went perfectly well and all the arrangements were very professional. Will definately recommend you and Barcelona golf for anyone who is coming to Spain. I would like to thank you for arranging everything for us, I can speak for everyone that they enjoyed the long weekend thoroughly. The golf courses were very good, I personally enjoyed Emporda and the Real El Prat golf club the most, I could have played a bit better but the course was super. T my knowledge no one had any problems with the hotel, that is always a good sign. All in all I think it went very well and your help in all of this was much appreciated. Thank you for your kind assistance for our Golf trip. Everything went well. The Hotel was excellent, both in quality and location. The Golf arrangements were also ok, and even the weather was excellent on Saturday and Sunday. Monday was challenging due to thunder storm in the morning but they were able to open the course (El Prat) in the afternoon. Many thanks for all your help with our trip. Everything was organised perfectly, coach was always on time, all tee times were as we had booked and the hotel had our details which facilitated a quick checkin. Emporda turned out to be a big hit with our group due to the fact that the hotel and golf clubhouse are so adjacent. Many said they preferred it to the PGA setup. All the staff in both the hotel and golf club were helpful and friendly. All in all the final verdict from the group was that it was probably our best trip to the Girona area. On behalf of 8 extremely satisfied norwegian golfers I wish to thank you for excellent advice and arrangement! The courses were in superb conditions, challenging and fun to play (we enjoyed Hills the most, maybe due to the beautiful scenery, and to play out last 9 holes at Ruins was wise, as all of us there got back the confidence in own golfing skills that was lost at Lakes and Hills), all the club facilities were great, the hotel provided just what we needed and it was nice & clean, the transport was 100% perfect (the only hickup – Saturday evening – was due to a misunderstanding between me and the driver) and everyone we met were friendly and professional. The only time we had to wait for a rather long time was at the airport due to lousy check-in organizing…which I guess BarcelonaGolf cannot be held responsible for. It will be a surprise if we don’t contact you again for another golf weekend within the next couple of years. The resort continues to up its game. Staff were very attentive to us. Apart from maintaining a supply of range balls, they gave us high quality balls for short game practice. Both courses were in great condition. Many thanks again. We’ll definitely be back in 2016 if not before it. Yes, thank you very much for everything, your excellent judgment served our group just perfectly. If there was any small point regarding the rooms, all of the rooms seemed similar, we could not say that the superior ones (Bruno’s and mine, 144 and 145) were any better. However that was not a problem, we were happy, they were all nice rooms :-). We all said we would even take our wives there (but not over the fathers day holiday The staff at the hotel were friendly and the food at the hotel restaurant was very good (better than the Aradi restaurant). Best greetings and whenever Spain is on the menu again (possibly even next fathers day) or when I come over with my wife, then I will be contacting you Thank you again for the absolutely perfect organisation. We may even try the same again but staying in Barcelona and playing some of the courses around.